CAT73239 Size: Large (6 feet) Features: -Small Dog Leash. -Sea Glass collection. -Material: Jacquard nylon webbing. -Durable dog leash for puppies and small dogs. -Two adjustment points. -2'' Trigger-style snap. -Unique vibrant pattern. -Proudly built in the USA. -Machine wash warm, mild soap, no bleach, air dry only. -Available in 2 sizes. -Small: 0.5'' W x 48'' L. -Large: 0.5'' W x 72'' L. -Click here to view Lupine's Sizing Chart:. Lupine's Sizing Chart. LUPINE products are GUARANTEED (Even If Chewed) Lupine understands the joys and frustrations of pet ownership! Although they can't replace the legs on your kitchen table, or your best pair of shoes, they can do their part to help keep your best friend out of the doghouse. Should anything happen to accidentally damage your Lupine product - including chewing mistakes - you can simply mail the item to Lupine: Lupine Returns PO Box 1600 Conway, NH 03818 Include your name, mail address & email or phone number. Your replacement goes back in the mail the next business day after the damaged item is received. There's no need to send the original receipt or our cost for the return postage. Thanks for using Lupine products! CAT73282 Size: Small (9" - 14") Features: -Adjustable Small Dog Roman Harness.-Material: Jacquard nylon webbing.-True non-restrictive harness, designed to eliminate pressure to the delicate throat area for puppies and small dogs.-Adjustable shoulder straps help to reduce strain on the neck and back.-Welded steel D- and O-rings and a heavy duty side-release clasp on the adjustable girth.-Unique vibrant pattern.-Proudly built in the USA.-Machine wash warm, mild soap, no bleach, air dry only. Options: -Available in 2 sizes. Dimensions: -Small: 0.5'' W x 9''-14'' L.-Large: 0.5'' W x 12''-20'' L. Collection: -Sea Glass collection. 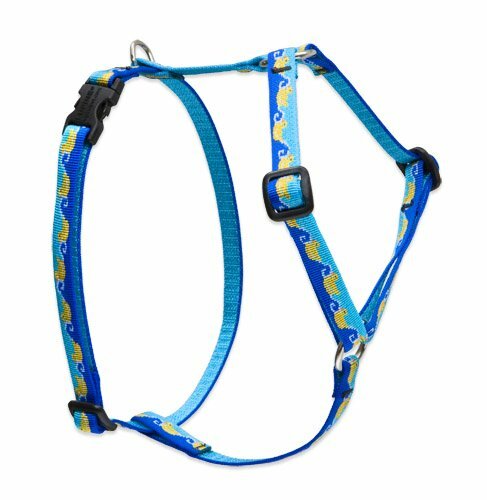 CAT73182 Size: Small (9" - 14") Features: -Adjustable Small Dog Roman Harness.-Material: Jacquard nylon webbing.-True non-restrictive harness, designed to eliminate pressure to the delicate throat area for puppies and small dogs.-Adjustable shoulder straps help to reduce strain on the neck and back.-Welded steel D- and O-rings and a heavy duty side-release clasp on the adjustable girth.-Unique vibrant pattern.-Proudly built in the USA.-Machine wash warm, mild soap, no bleach, air dry only. Options: -Available in 2 sizes. Dimensions: -Small: 0.5'' W x 9''-14'' L.-Large: 0.5'' W x 12''-20'' L. Collection: -Just Ducky collection. 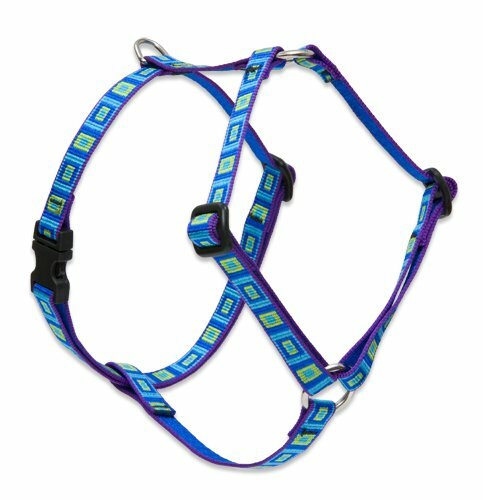 LupinePet Basics 1/2" Blue Cat Safety Collar with Bell , 8-12"
17527 Color: Blue Features: -Collar. -Adjustable. -Ideal for cat. -Machine wash. Product Type: -Collar. Color: -Blacks. Color: -Blues. Pet Category: -Cats. Generic Dimensions: -8'' L x .5'' W x 0.5'' D, 0.03 lb. Dimensions: Overall Width - Side to Side: -.5 Inches. Overall Product Weight: -0.03 Pounds.